Spectacular Crane Lake offers something for everyone when it comes to fishing variety and quality, all in the picturesque and magnificent setting of Voyageur's National Park and the Minnesota/Ontario Boundary Waters region. Here, chiseled from the oldest exposed granite outcroppings on the face of the Earth, await a smorgasbord of interconnected lakes and rivers offering anglers a host of species, including all of Minnesota's popular gamefish species. Visitors to Crane Lake marvel at the different ways to explore the region. A number of classic Minnesota northwoods resorts featuring both American and housekeeping plans, campgrounds and canoe outfitters, fishing guides, a floatplane base, and even a houseboat operation provide a full range of options for accommodations and service. What's more, because this area of Minnesota's Boundary Waters features no horsepower restrictions, anglers can even travel by motorboat throughout the Park. Although the ability to access so many different fishing spots provides excitement and variety for any fishing adventure, many anglers find all the fish they need in the three main bodies of water accessible by water from the town of Crane Lake. Crane Lake, Sand Point Lake, and Namakan Lake--together with numerous adjacent lakes accessible by portage--comprise waterways that offer more variety in fishing than just about any other Minnesota destination. There are even two "mechanical portages" here-boat trailers mounted on railroad tracks that haul big fishing boats across Loon Falls Portage (and into Loon Lake) and Beatty Portage (into Lac La Croix and the western/southern edge of the Minnesota Boundary Waters and Ontario's Quetico Provincial Park). The smallmouth bass fishery in Crane Lake has a long-standing reputation, but each year the numbers and average size of this hard-fighting gamefish improve. With numerous shallow bays and shorelines strewn with skull-sized rock providing perfect smallmouth spawning habitat--plus an increasing catch-and-release ethic from anglers--"footballs" are showing up more frequently in creels. In the spring of the year, shallow fishing is the norm. Live bait anglers tip a light leadhead jig with a leech or piece of nightcrawler and pitch to shoreline boulder and gravel areas. Artificial presentations likewise entice strikes from aggressive smallies, with a smoke-colored tube jig being one of the local favorites. During early morning light and on days featuring calm conditions, topwater lures, such as Skitter Pops and Zara Spooks, attract huge surface explosions. Although much less common than their brethren, largemouth bass also are available in the Crane Lake area, targeted in weedy areas by savvy bass anglers. The bucketmouths of Crane Lake, though uncommon, grow big here. Spinnerbaits and slop-fishing presentations like jig-n-pig or Texas-rigged plastic worms, deliver the best results. As the season progresses, many of the biggest smallmouth bass migrate to the numerous deepwater basin reefs. Although some fish still are taken from shorelines and from around the many islands that dot the waters of the Crane Lake area, a ciscoe forage base draws the biggest predators to main lake areas. Reefs that top out from 17-30 feet are prime locations. Anglers catch smallies with tubes, or with live bait, worked slowly around the edges and on the tops of the reefs. In summer and fall, the smallies become accustomed to rising to feed on passing schools of ciscoes, a pelagic, schooling baitfish that roams the deepwater regions adjacent to the reefs. On sunny, calm days, a noisemaking lure like a Rattlin' Rapala or Husky Jerk casted and retrieved atop these reefs will draw smallmouths from the depths to rise 10-15 feet or more to strike the lure. Preferred color patterns are white or silver to match the bright-sided ciscoes. Anglers likewise ply the main lake reefs from summer through fall to experience excellent walleye fishing. In the spring of the year, any of the current areas where streams and rivers run into the lakes attracts walleyes, as well as their closely related cousin the sauger, another species commonly found in these waters. By the post-spawn period, however, both walleyes and saugers of size quickly move en masse to the reefs, evacuating the shoreline spawning grounds. Classic walleye presentations such as a jig and a minnow or a live bait rig featuring a slip sinker and hook impaled with minnow, leech, or crawler will take numbers of walleyes. A protective slot limit ensures that prime spawners are returned to the lake, and on most days, catching a limit of eating-size walleyes for shore lunch or dinner is an easy task to complete. Occasional trophies exceeding the slot size are taken as well. From a walleye angler's perspective, few of life's joys surpass catching a limit of fish surrounded by the breath-taking beauty of Voyageur's National Park. Enjoying a fresh walleye and sauger shore lunch prepared amid the towering pines--or relaxing on the deck of your lakeside cabin after a day of fishing--is as good as it gets. The fishing in Crane Lake pleasantly surprises northern pike and muskie anglers. In classic "Canadian Shield" form, the big fish hold in shallow, weedy bays and along shorelines in spring, but soon migrate to the basin areas for a summer and fall spent feeding on the roaming schools of ciscoes. Anglers can target a variety of hotspots for fish, either by casting or trolling, or by working cabbage growth, rocky shorelines around islands near deep water, plus weedline fishing in the many bays. Spoons, bucktails, and spinnerbaits take numbers of fish, while the biggest predators usually fall for a large jerkbait or trolled lure. Although not numerous in the Crane Lake area, big muskies are available. Not traditionally stocked here by the DNR, it's believed that brood stock migrated through Vermillion Falls from adjacent Lake Vermilion (yes, two different spellings), a nearby lake heavily populated by muskellunge. Slab crappies inhabit Crane Lake. When schooled in late summer and fall, fishing can be fantastic for this delicious table fare. Suspended schools hover over deep water and are caught with tinsel jigs and minnows either jigged or dangled beneath a slip float. Fish approaching the two pound-class sometimes find their way into angler catches. Besides Crane Lake, some of the portage-in lakes feature excellent panfishing for sunfish, bluegills, and crappies. Lac La Croix offers some of the best lake trout fishing in the region. Fish are probed in the 70-90 foot depths using white one-ounce jigs tipped with either frozen smelt or large shiner minnows. Electronics are a must to spot the roaming lakers, necessitating precise boat control to hover atop these fish while jigging a high-profile presentation in front of the fish's nose. After a typically vicious strike, lake trout ranging in size from 8 to 25 pounds put up a tremendous battle on medium-action spinning rods spooled with 8- or 10-pound test line. 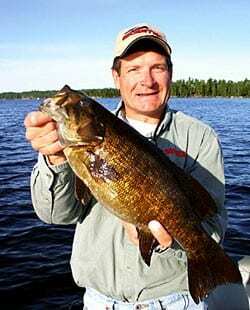 Setting aside a day or more to explore Lac La Croix (which also offers tremendous smallmouth bass, northern pike, and walleye angling) is a worthwhile option during your visit to Voyageur's National Park. The many fine resorts and outfitters in the Crane Lake area will work with you to maximize your fishing experience. Something's always biting on area lakes; fishing information and advice are easy to come by. If you like, consider hiring a guide for a day or a week to learn the local skills and techniques. You'll enjoy exploring and seeking new water on your own thereafter. There are thousands more fishing spots than fishermen in the Crane Lake area; you can always enjoy complete peace and serenity for your entire fishing vacation. The beauty of the region is unparalleled and the tremendous multi-species opportunities provide variety for adults and kids alike. Put fishing on the agenda during your stay in the Crane Lake area, and you certainly won't be disappointed!